Bouldering might feel just appear to be just a bit of athletic fun on some rock, but some take it very seriously indeed ... even archaeologists. 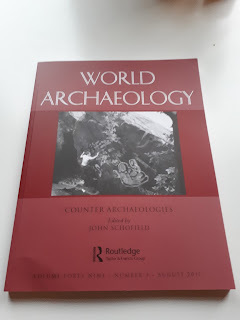 The latest issue of the academic journal 'World Archaeology' features an article on the idea of 'counter archaeology', as practised by boulderers at Dumbarton Rock (amongst other visitors such as graffiti taggers/artists). It's always worthwhile taking some reflective time to consider what our activities mean in the greater scheme of things, and how they might appear to someone who has never witnessed this activity. In more imaginative contexts, some might see bouldering as 'costly signalling behaviour' (showing off), or consider it a pure form of non-representational theory (talk to John Hutchinson), and some might just call it 'bonsai mountaineering' (my term). Anyway, it was all a collective effort instigated by some kind archaeologists at ACCORD, an enlightened group of enthusiastic people who believe in opening archaeology to everyone... check out some of their projects at this open access site >>> which includes a 3D model of the Pongo boulder. Hamish Fraser's energies and enthusiasm for king lines has added to the burgeoning wealth of bouldering on Rum over the last 5 years. Despite the weather, midges and difficult logistics of approaching these allivalite giants, high under the looming presence of Hallival, it's all truly worth it! Some of the first ascents from this year's trips can be viewed on this video. Rum Bouldering 2017 from Hamish Fraser on Vimeo. His updated guide for 2017 is now released. You can download it here on the Boulder Scotland website. In his famous 'allegory of the cave', the Greek philosopher Plato pondered the artificiality of reality in imagining how we could be fooled into thinking shadows on the wall (i.e. virtual reality) could be seen as 'real' life. I'm paraphrasing, of course. What has this got to do with climbing? Well, I was pondering this myself recently while sitting on an artificial concrete boulder at the new Cuningar Loop bouldering park in Glasgow. Does it really matter that a boulder is made of concrete, surrounded by plantation and skirted with kind gravel traps rather than tree roots and spikey boulders? Isn't the 'real' thing so much better: the isolated erratic bloc deposited by geology's long-term aesthetic artwork? Well, yes, that's entirely up to you, but sometimes the artificial saves the day ... I was scuppered by Glasgow's cross-town traffic and turned back to my local artifice that is Cuningar to climb the blue circuit I had imagined as something akin to the real Fonatainbleau. With the wind shivering through the tree canopy and the sun catching the light-coloured moulding of the concrete, I was almost in the real thing. That was good enough for me - Plato can cast all the artifical puppet-shadows he wants, I'll accept the story it tells! 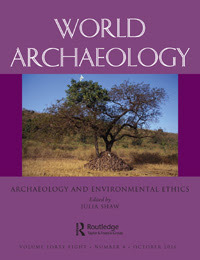 Dumby gets an academic approach in this article published by World Archaeology. This multi-authored article was the result of archaeologists, climbers and heritage professionals examining the meaning of Dumby for those who frequent the place, especially climbers. The notion of counter-archaeology is echoed by the opposing faces of the volcanic plug of Dumbarton Rock, Scotland. On the one side is the ‘official’ heritage of Dumbarton Castle, with its upstanding seventeenth-century military remains and underlying occupation evidence dating back to at least the eighth century ad. On the other side lies a landscape of climbing, bouldering and post-industrial abandonment. This paper develops counter-archaeology through the climbing traditions and boulder problems at Dumbarton Rock and brings to the surface marginalized forms of heritage. Climbers and archaeologists have co-authored the paper as part of a collaborative project, which challenges the binary trope of researcher and researched and provides a model for a collaborative, co-designed and co-produced counter-archaeology. There is that magical transitional time in Scotland between the green dankness of winter and the dreaded muggy midgeness of summer ... a dry springtime. April 2017 was cool and fairly dry so allowing some pleasant sessions on the blocs and the sudden blazing high that arrived at the start of May turned the highlands into a paradise with a cool north-easterly airflow. Those lucky enough to have some time off would have had some good bouldering days out in big landscapes, or even small ones! The danger with fakes, if they are done well, is that they legitimise every construct built upon them. Any archaeology, but especially one with faded logics and contexts, is susceptible to imagination. A few years ago I found this petroglyph beside a grouping of cup and ring marks in the sandstone outcrops of Cochno Hill on the Clyde, and it recently surfaced in my memory as the nearby Cochno Stone was briefly unearthed for laser scanning, (which Ludovic Mann 'matrixed' with a grid in the 1930s to force on it his interpretation of astrological significance to the ancient markings). The sandstone outcrops of the Kilpatrick Hills have long been known for their remarkable collections of rock art such as the said Cochno Stone, Whitehill, Craigmaddie, Auchentorlie (Greenland Quarry), but the Clyde is also no stranger to fakery and the persistence of human mischief - witness the fiasco of the Dumbuck Crannog. This vanity project was riddled with fakes buried and unearthed to draw attention to the amateur archaeologist William Donnelly. Alex Hale wrote a great book on the Dumbuck Crannog excavations and the controversy of the fakes. 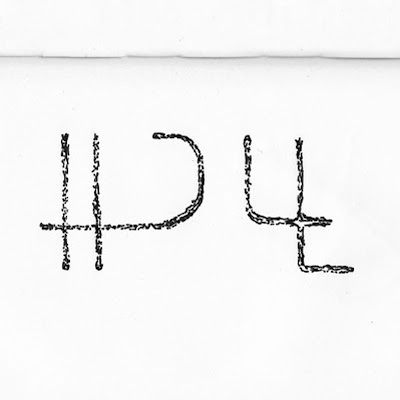 The provenance of these markings is seductive next to more ancient cup and ring designs, as the 'letters' inscribed suggest an alphabetic rune system, though they do tend to too closely resemble modern English letters with the extra crosses and tails. 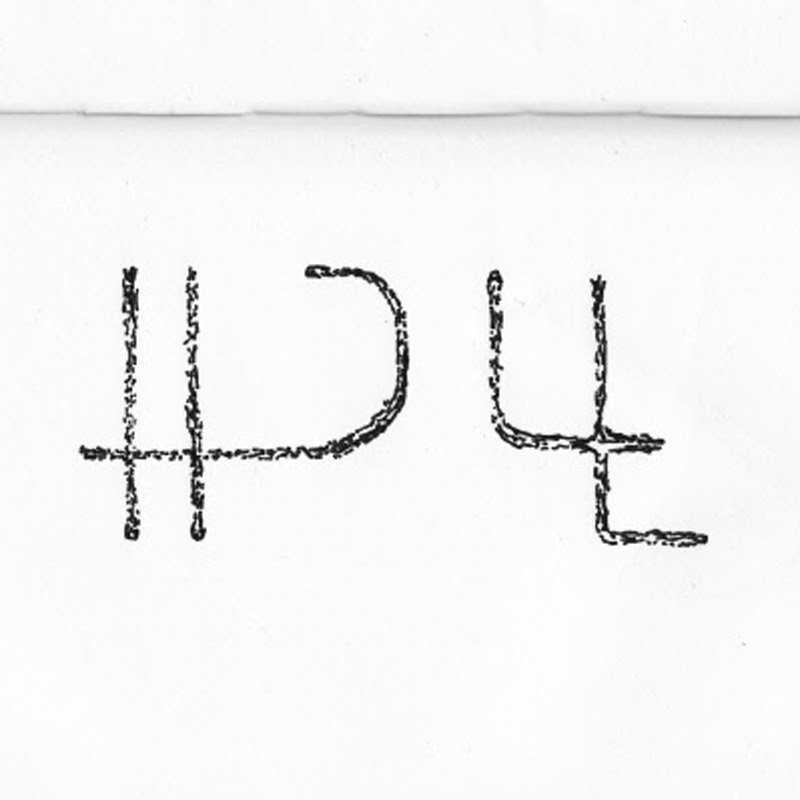 Two 'letters' - a name perhaps? Which way up do we look at them? Who did this, when? Why? It's impossible to tell, there are no known similar markings nearby, no Rosetta Stone, and quite possibly more reasons to believe it is a fake than believe it is contemporary with the cup-marks (chiselled lines suggest metal, rather than hardstone-pecked circles and grooves). Considering the Donnelly affair at Dumbuck Crannog nearby, my suspicions were aroused. In Archaeology, fakes can create coherence as much as suppositions of unity based on isolated and 'genuine' material items. 'The hill of the Caledonian pixies', if you like, is the classic pyramidal mountain - a stalwart of Scottish Munroists and regal in its isolation amongst the feeder lochs for the Tay and Tummel rivers. In 1774 its isolation was what attracted Nevil Maskelyne and Charles Hutton as they sought a regular and massive part of the earth they could measure, weigh and extrapolate the weight of the Earth. The tale is told entertainingly in Ian Mitchell's Scotland's Mountains before the Mountaineers. (Edinburgh: Luath, 2013). Perhaps of most enduring legacy was Charles Mason's method of slicing the mountain into conceptual layers to calculate weight, which led to the idea of contours as a useful topographical tool. 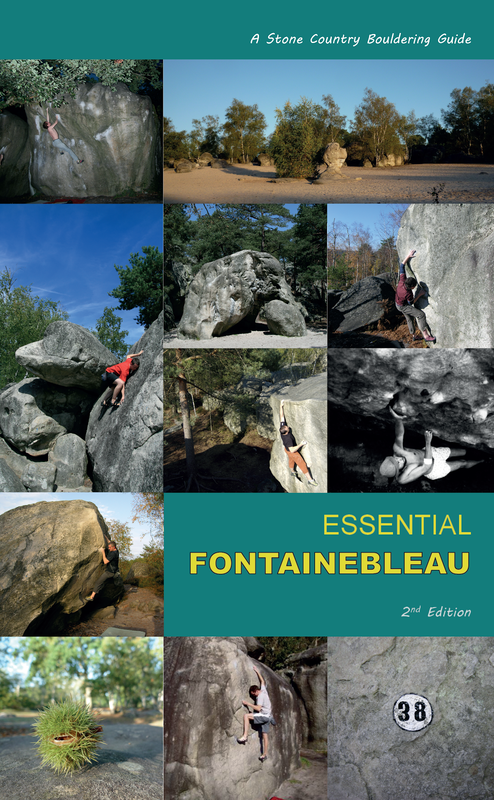 The making of this guidebook took a lot longer than expected, rightly interrupted by dozens of new venues, plus the interim issue of the new edition to Essential Fontainebleau! For this edition, published a criminal nine years after the second edition, it was greatly aided by some local experts and I'd like to thank the advisory editors, your gratis copies will be on their way shortly. 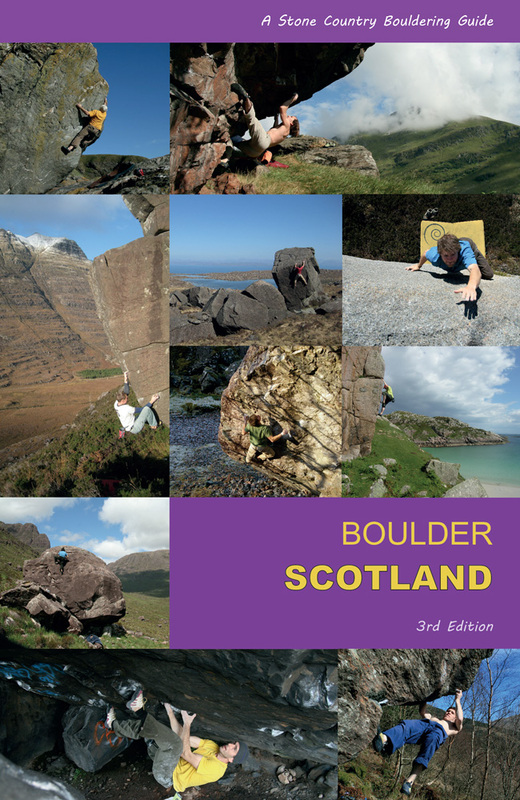 As general editor, the intention of this guide is to provide a balanced overview of Scottish bouldering, in terms of place, grade and general variety of experience, and especially to give the new visitor a gazetteer to get the best out of a visit to Scotland wherever they end up. We hope it is a tribute to this beautiful country and the practice (some say art) of bouldering in the wild. There are many people to thank, not least the advisory editors who helped build and proof this guide, in particular: Colin Lambton, Nigel Holmes, Dan Varian, Pierre Fuentes, Kevin Howett, Gaz Marshall, Tom Kirkpatrick, Hamish Fraser, Richie Betts, Ian Taylor, Robbie Gardiner, Stewart Cable and Andrew Hunter. The publisher is grateful for their advice and tolerance to the general editor’s errors and in some cases excesses of enthusiasm. I have perched on icy ledges in a winter storm, listening to the main-sail buffeting of a wind against a large rock buttress. It creates deep booming sounds on impact and surreal whistles and songs as it howls through fingered gaps in the shattered rock rims of corries. There is a high lonely corrie to the east of the summit of Ben Dorainn called Coire Chrutein ('Hollow of the Harps') with a rocky wall called Feadan Garbh ('rough chanter') which perfectly captures the suggested soundscape of a mountain in a storm, and this aural presence to a place often needs extreme weather for us to be conscious of it, yet it is always a present and often subtle informant of place and feeling. Of course, we are all familiar with more gentle sounds of summer such as rills and burns tinkling over rock-steps, or larks improvising their jazzy song in deep blue skies, but it belies the rules that when 'looking' at landscape we take for granted the rich soundscapes that colour our impressions and memory. Sound and stone are rarely twinned but in prehistoric times this was more common and the many examples of 'musical stones' around the world, such as at Mudgal in India (below), show that landscape is enhanced by sound especially if it is seen as 'hidden' or or special, so you can see why it became ritualised or revered as something otherworldly or in the spiritual realm, rather than the everyday. Currently, a project at Huddersfield University, run by Rupert Till, is studying the sound architecture of ancient monuments such as Stonehenge, suggesting they had an aural ritual purpose, with harmonics and repetitive echoing rhythms an integral part of their design. The sound clips recorded here are indeed impressive. Could this interpretation be extended to the Stones of Stenness on Orkney, or even the Callanish complex in Lewis? 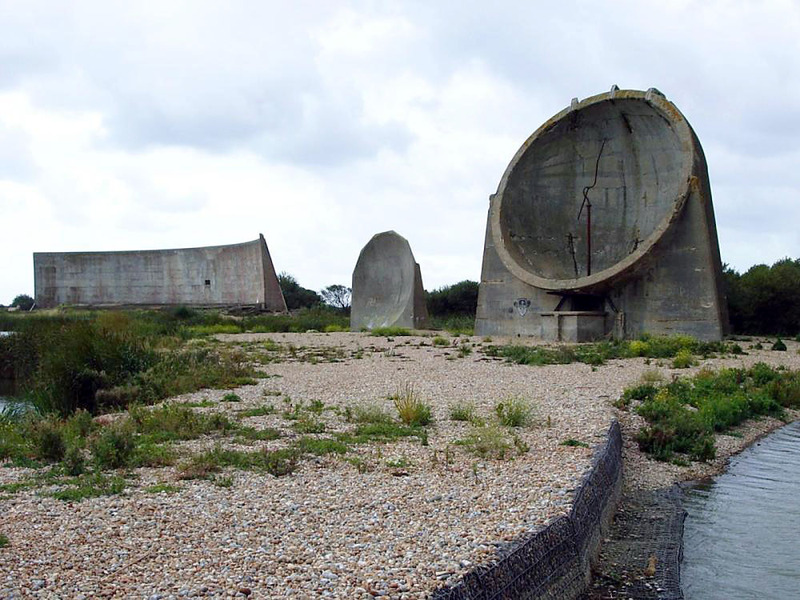 This is a growing area of enquiry known as 'soundscape ecology' and the natural geological sounds I refer to above can be classed rather musically as 'geophony'. For more read here. As counterpoint to a new series of books coming from Stone Country Press, I thought I'd introduce a few more elements of landscape theory and philosophy on this blog. The new series - Lifescapes - will reflect the mix of outdoor activity and philosophy as a means of expressing contemporary thoughts on various ways of 'being' in the outdoors. After the mechanisation of farming, the technological monoculture of living off the land has left very few of us living close to the natural world. We mostly hunker in urban centres briefly catching the play of light and nature through city windows. I write this at a tenement window, where occasionally a sparrowhawk throws panic amongst the local finches and pigeons, but it's all very fleeting. Still, the urge to be part of a bigger natural world, even within the city, exists in many pursuits and interests. From my own perspective, this found active representation (or non-representation, as it might now be perceived), in climbing, mountaineering and bouldering. But any modern outdoor activity shows some connection to the natural world, despite the obvious alienation that can come with obsession with technology and the formality of how we structure the social and competitive elements of our interests. Climbing/walking/running/cycling/kayaking/fishing - name your sport - are still all methods for being in your landscape, of moving through it with purpose for a while, or for just getting your hands dirty. Sports, in essence, are the modern way of growing our identities of place. Leisure activities have progressed and become so much more sophisticated, in terms of technology and rules of engagement, since the Victorians kicked off their empire of leisure pursuits, to the point where a sport such as mountaineering can include so many sub-sports, or offshoots, such as dry-tooling, bouldering, sports climbing, and 'traditional' climbing ... a long evolution from the Alpenstock ice-axe! They all root to the same core desire, to be outside, finding our place, temporarily marking our spots with codified athleticism, or scribbling our names on the wall of time in a kind of temporal invisible ink. I like to think of a blog or social media as invisible ink, drying briefly to focus a message, before it dissolves again before your eyes.